An Amish man observed a fellow moving into his community. 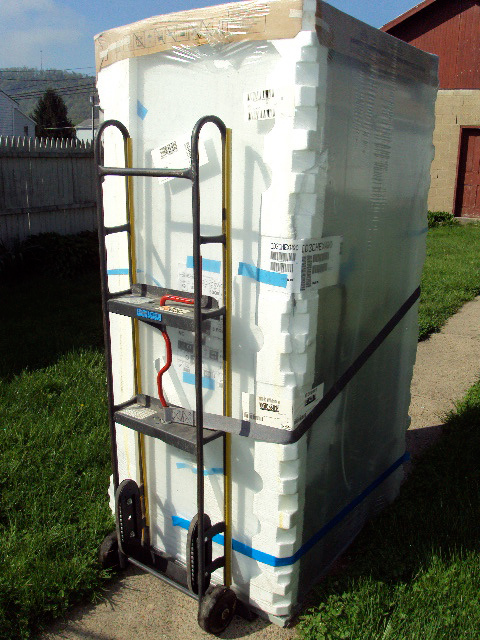 Among the items being unloaded from a truck were a large refrigerator with ice maker, a state-of-the-art sound system, a smart TV, and hot tub. The following day the Amish man went by the neighbor’s house brandishing homemade muffins. After greeting him, the Amish man said, “And if anything should go wrong with your appliances, don’t hesitate to call. “That’s very generous of you,” the new neighbor replied, thinking he must be a clever repairman. No problem, said the Amish man, I’ll just show you how to live without them. Persons content persons with what they have, tend to be more thankful. I would dare to say almost all of us have more than enough to make us content. I go to the grocery store and sort through six different kinds of lettuce before spotting the plain iceberg lettuce on the bottom shelf. I once had a brown and black pair of shoes, along with a pair of tennis shoes. I now have 16 pairs of shoes, I seasonally interchange. Thrift is no longer virtue and consumption isn’t a vice. It causes me to pause and wonder when will I have what I need to be content. It is a modern phenomena to pursue happiness by collecting stuff. It began after the Industrial Revolution. Over the last 250 years the consumer has been born as manufacturers continue to produce the better tools, so we can produce better products that promise us a better life. The cycle the consumer culture spins around is-the more we produce, the more we need to consume, so we can produce more; giving birth to the advertising age. According to the Book of Advertising, “The art of advertising isn’t about “comparison of quality, service, or price. 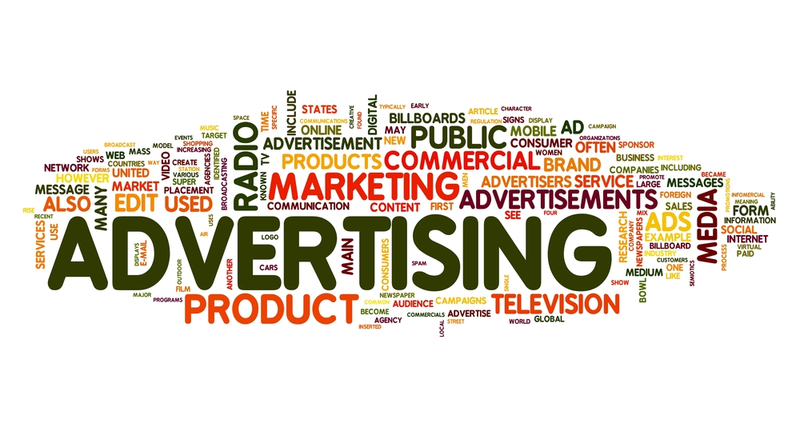 Advertising teaches the consumer of wants they don’t recognize and where their wants can be supplied”. The modern economy has perfected it appeals to our ego; and like no other time in history. It invites us to believe the purchase of a product will provide us an experience that will so satisfy us we can know perfect contentment. Yet, the retail economy also a use a slight of hand, when as it regularly improves a product during seasonal intervals, which keeps us from knowing perfect contentment. Our consuming ways makes it difficult for a person to be thankful for what they have and express it with authenticity. 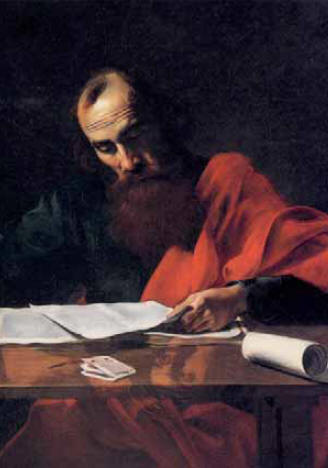 Things are different than when Paul wrote this letter. He couldn’t imagine our desire for things that causes us to seek happiness by purchasing things. His contentment was based on a joy that sprung up from the inside out; knowing what happens outside of him is filtered by what is happening inside of him. This letter is dripping with unrelenting thanksgiving: for the Philippians’ relationship with God, each other and him; their progress in the faith’ and their faithfulness in tough times. Specifically, Paul is offering thanks for an unexpected gift. In his thank you note, he reminds us no one should be fooled into thinking external gifts are the source of contentment. While saying thank for their gift and concern he l declares I can be content in plenty or want. Paul didn’t wallow in self-pity during times of want or swagger in self-pride during times of plenty. Paul embraces each moment and person as a gift; refusing to do gymnastics; trying to change circumstances he didn’t like in order to be happy. He doesn’t waste energy trying to change things he couldn’t change; looking for contentment in all the wrong places. Paul embraces his circumstances as a gift, which fostered in him an attitude of gratitude regardless if he had what he wanted, needed or thought he deserved. We will make thanksgiving more difficult this year if our well being is based on what people do for us or what happens to us. People or circumstances can’t make us happy or unhappy, except for the power we give them. We give what people power when we approach our day with reluctance of being around a certain person at work or school. We give circumstances power when we ask is it Friday yet. 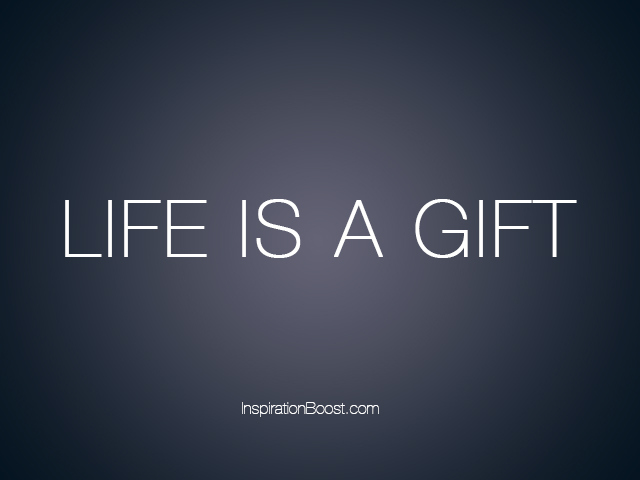 We rob people and circumstances of their power over us when we treat all moments and persons as a gift. It takes spiritual eyes to see these as gifts for whom we are grateful. From this perspective comes a heart that is content in plenty and want. 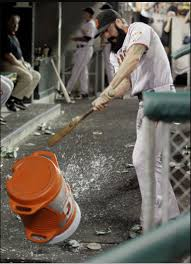 In some baseball clubhouses you will see a sign on the water cooler that says, Please do not hit me. I’m a nice water cooler. Legendary Yankees manager Casey Stengel said to Mickey Mantle after he beat on the water cooler: Mickey, it ain’t the water cooler that’s getting you out! We hinder our expressions of thanks if we’re waiting for something to happen someday in order to be content. It is stinking thinking to believe there is a natural happiness that happens because what we expect to happen happens. Contentment doesn’t happen naturally, it happens synthetically; synthesizing circumstances and persons into our lives as gifts, which allows us to say I can be content in plenty or want. 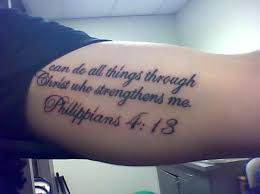 Paul speaks of being content in plenty and wants when he claims; I can do all things through him who strengthens me. Keep the verse in context to understand what Paul meant. He is saying I can do all things through Christ who strengthened him whether I am hungry or well-fed. The power of Christ did not deliver him from want to plenty; it aided him to be strengthened so he might be content regardless of his circumstances. Athletes foolishly rely on P.F. Flyers Sneakers theology: “Jesus will make me run faster and jump higher”; thinking it gives them an advantage on the court or field. So, an athlete thanks Jesus for helping him hit a game winning homerun; contributing his success to the good Lord; sometimes failing to mention the steroids. This implies God was not with the pitcher who threw the home run ball when an athlete gives God all the credit. God doesn’t promise we will have an advantage over the world through the special super powers of Christ that flow through our metabolic system. We all know there are things we can’t do. We will never run 100-yard dash in 10 seconds or jam a basketball in a 10 foot goal. We can’t grow taller, make our kids to make the right decisions, or make everybody happy. The “all things” we can do through Christ who strengthens doesn’t mean Christ will raise or deliver us above our difficult circumstances. Christ will strengthen in every circumstance whether we have what we want or not. We follow a Savior who claimed all circumstance as a gift. He walked through the depths; welcoming each moment as a gift, assured of a power that could change anything. Persons and circumstances become gifts when we act on our belief that God is in the process of transforming all things, no matter how difficult things may seem at this moment. Christ hung on the cross; believing great love changes human hearts. When the Pilgrims touched Plymouth Rock in 1620 and made it to shore, they found a deserted village they appropriated it; naming it Plymouth Colony. The village had been named Patuxet and was the home of people who were a branch of the Wampanoags. The majority of his people died from smallpox in 1618. The village was a ghost town. The Pilgrims were helped out by Squanto, a Wampanoag himself and a former inhabitant of Patuxet. Squanto learned English after being sold into slavery and making four trips back and forth between the two continents. After a heroic nine year odyssey, he made it back home to find his people wiped out. So, he taught the Pilgrims survival and agricultural techniques, setting in motion fifty years of peaceful relations between the Wamponoags and Pilgrims. 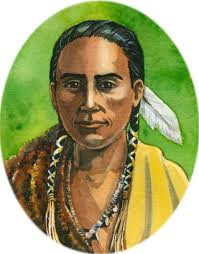 Squanto’s life was marked by tragic circumstances, yet he wasn’t crushed; using his circumstances helping others share the land. 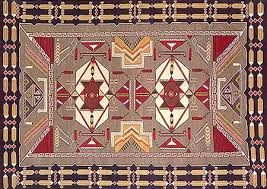 In an authentic Navajo rug, there is always one imperfection woven into the pattern. According to tradition, this is where the Spirit moves in and out of the rug! The Native mind is comfortable with the idea that perfection isn’t the elimination of imperfection; it’s the ability to recognize, forgive, and include imperfection; just as God does with us. When we see God make us perfect through our imperfect lives, we discover the beautiful and hidden gift of God underneath the circumstances and persons in our lives. The “pearl of great price,” is to see all of life as a gift that our gracious God uses for good. This is what Paul means when he says, “Again, I say rejoice. I have traveled thirty times are so with willing souls to far places to serve with some of God’s best people in a variety of ways. These are normally called mission trips. It is beginning to occur to me my nomenclature may be misguided. 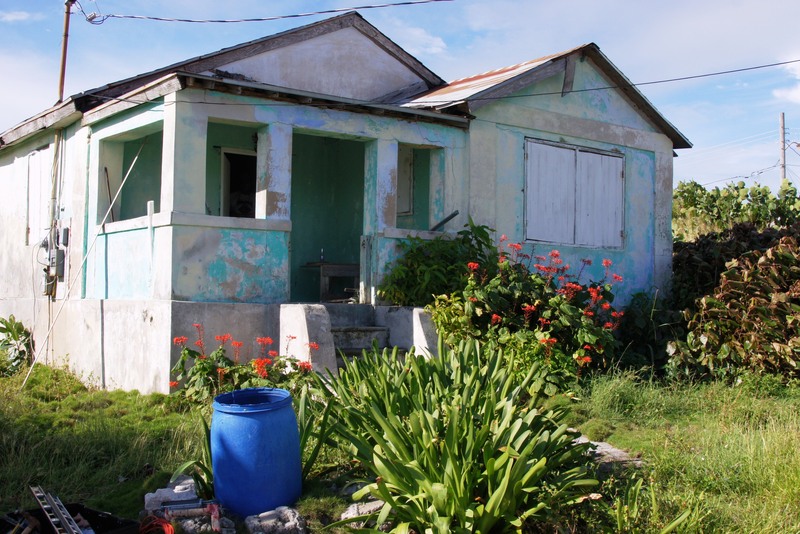 This year’s traveling team is made up of an excited group of persons headed to the island of Eleuthera, one of the 700 islands that make up the Bahamian nation. 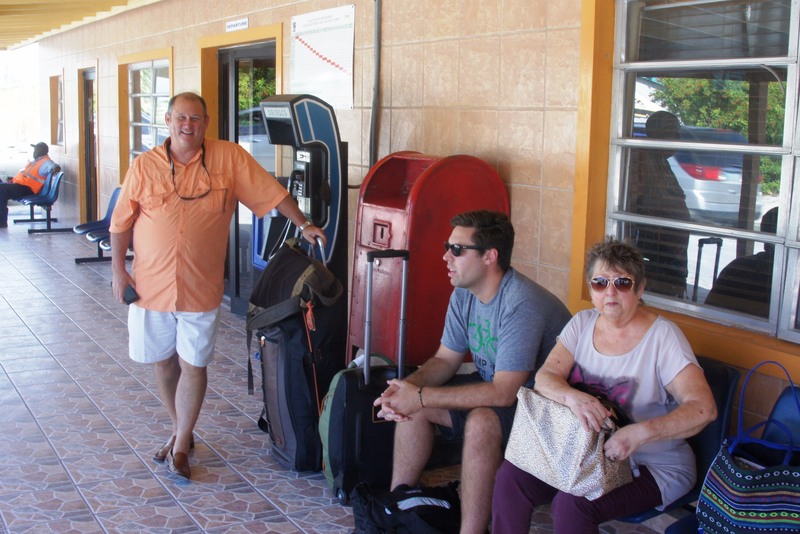 They have eagerly anticipated making this trip because it is a return trip, a year later. They grew fond of the persons they served with last year; fueling a familiarity that simply feels good. -Steve, a truck driver, whose impetuousness oozes so much out of his skin that everyone admires his heart, even when his words come too quickly. -David, a welder, whose steadiness could make tight rope walker appear wobbly, though wondering how he might once again find steady employment in the twilight of his working years. -Mary, the singer of many songs, who serves others while learning to integrate a grief that still lingers from the loss of her spouse; yet also learning a new song for a new day. -Garrett, our new youth leader, who is our able bodied one; making new connections as he carefully walks with new people into new places. 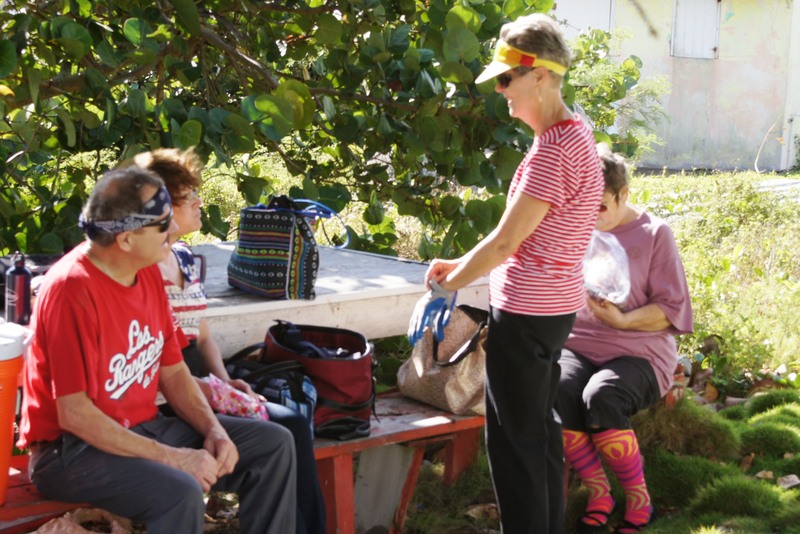 -Sharon, our veteran missioner, who has said yes for so long to adventures like this, that it would be understandable for her to say no, as she approaches her maturing years with limits we know or will sooner than we might imagine. -Tracy, whose quiet faith speaks loudly. He said yes to this trip after experiencing a windfall to cover the costs of the trip, despite uncertainties at his own place of employment. -Joy, whose recent circumstances cause others call her Job; recovering from a less than week old assault that makes walking more difficult for her than an advanced calculus problem. -Me, their spiritual leader, at the helm with wounds and scars that keep me humble enough to remember it is just as much a privilege to guide this little rag tag band as it is to lead a Sunday morning congregation. Here we are in a far off place. Is this really a far off place? I prefer to call it a new neighborhood. 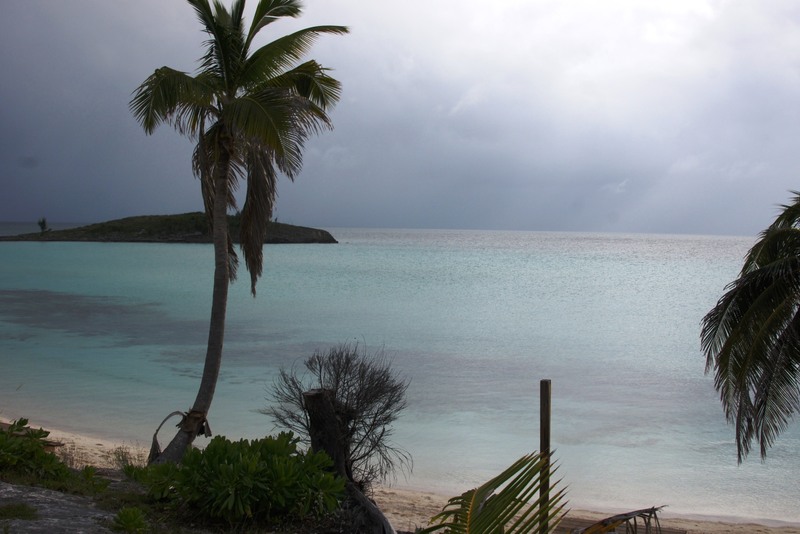 We traveled in a metal tube at 450 mph for 1300 miles in little more than a half of day to touch down to eat, work and play with our new neighbors in Hatchet Bay, Governors Harbor, Bahamas. Here we are on a mission trip. 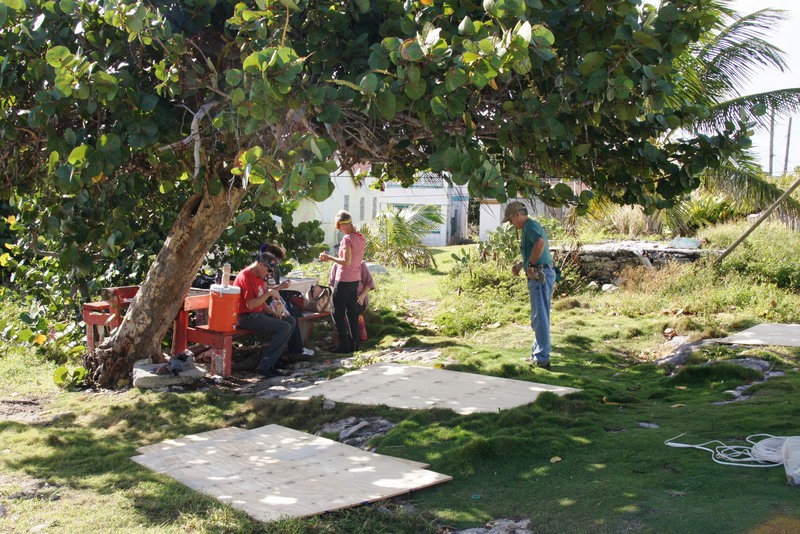 Is this really mission trip? I prefer to call it a rehabilitative trip. All things stands in need of being renewed-the houses we work on each day, the relationships we nurture, and even our own souls we offer. The more mending we do the stronger we become. So, we are here in this picturesque new neighborhood, patching up the interior of a house while connecting ourselves to new friends. Somehow our work works on us too; doing the needed rehabilitative work our souls need to maintain spiritual health. You were born in the back seat of America, And you pride yourself in sharing her. Taught to work to please and pray on your knees. You pay for your cheap grace with your nominal fees. Better heal yourself, child. Heal yourself. Think about healing yourself. Our little rag-tag group is not thinking about healing; it is happening to each one of us whether it can be seen or not. Grace becomes amazing when we encounter new places and people with an open heart that is willing to be made whole. Before newspapers and smart phones there were church bells, which rang announcing events, like a death.The bells were the social media of the day.Now,w know death has come and to whom almost instantly via the new TGIF, Twitter, Google, Instagram or Facebook. 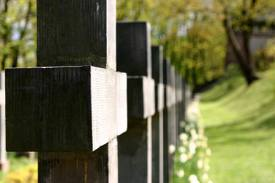 In a funeral message,poet–preacher John Donne spoke of how individual we are, but still more connected than separate. From his pulpit in St.Paul’s Cathedral he said: “No man is an island,entire of itself. Each is a piece of the continent, a part of the main. If a clod be washed away by the sea, Europe is the less. Each man’s death diminishes me, for I’m involved in mankind. Thus,send not to know for whom the bell tolls. It tolls for thee.” The older I grow, the harder it’s to see the people I love die; it makes me wonder of my own passing. 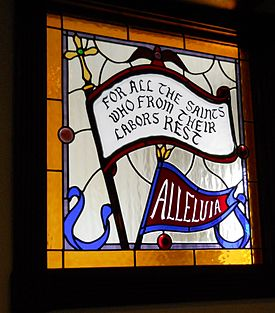 We all have these are feelings on All Saints Sunday as we remember persons in our church and lives that died in the last year by reading their names and chiming a bell into the solemn silence. We come to an All Saints Sunday not to recite what a great guy or gal this or that person was. They were all unique with endearing quirks we loved and could annoy us at the same time. We’re not here to hear about them. We’ve come to hear the good news of Jesus Christ ring aloud that declares Jesus can do for us what we can’t do for ourselves; dig ourselves out of our own grave. We profess he is the only one who ever got out of a tomb alive. So we look to these who have been set free by this powerful God-given grace of Jesus as our model and hope. We recommit ourselves to live up to the legacy of their faith in Christ who is at loose in the world still raising the dead. 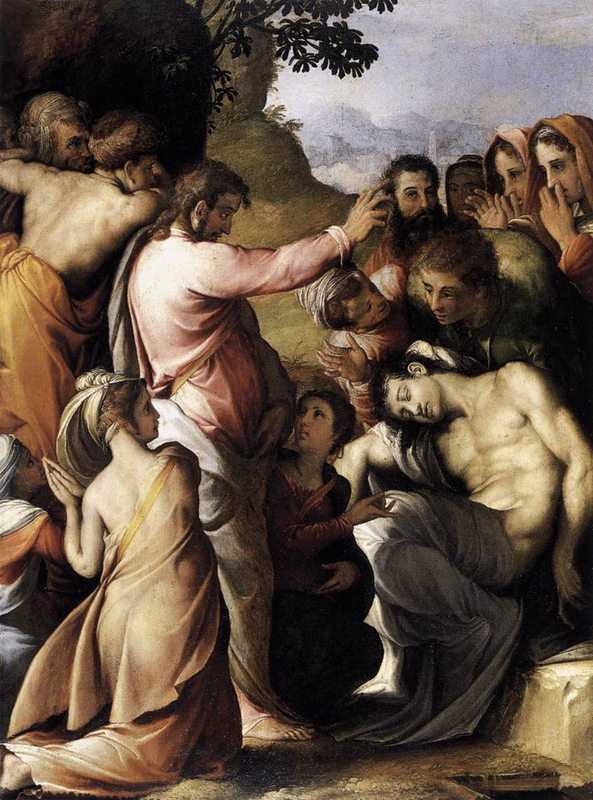 John’s gospel story declares Jesus can raise the dead. We jumped into the tale as it gets good, but it’s a long story that needs some setup. Lazarus, Mary, and Martha live together in Bethany,which tradition says was about a mile and a half from Jerusalem to the east of the Mount of Olives.Mary is the one who anointed Jesus feet with costly perfume while Martha fumes from the kitchen. All three were close friends of Jesus. Lazarus becomes sick unto death and his sisters send word to Jesus. Jesus doesn’t rush; he tells his disciples Lazarus’ illness won’t end in death,but God will be glorified.They stay two more days and then set out for Bethany. On the way,Jesus says Lazarus has fallen asleep; they think he’ll recover. Jesus meant“asleep”as in“dead, he looks at death differently than we. We understand why Jesus saw death differently when we understand him. Revelation 21 helps; giving us a vision of how everything is going to turn out and what is happening behind the scenes. 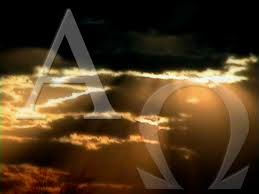 The Revelator describes Jesus as the Alpha and Omega, the first and last letters in the Greek alphabet. Our first declaration of faith is Jesus is the Alpha, present at the explosive moment that created all things; and he’s the Omega, present at the moment when we dwell in eternity. He stands at the head and foot of all things. We think of the origins of life and wonder how we came to be.The Bible doesn’t tell me how Sophia came alive, but it gives me a poetic rendering at the beginning of the book that calls all things created good. We think of the end of life and wonder where we’re going.The Bible doesn’t tell me how my mom was transposed to new life, but it gives me a poetic rendering at the end of book telling of a new creation calls it good. St Julian of Norwich summed it up: “All shall be well, and every manner of thing shall be well.” At the beginning and end times,the Alpha and the Omega stands, Jesus our Lord. We chip away at our faith when we’re anxious about how things began or end; those belong to the One who makes things good. Jesus is also at work making all things good in the between times of Alpha’ and ‘Omega,–from Beta to Psi; the letters after the Greek ‘A’ to ‘Z’-our ‘B’ to ‘Y’. Lazarus’ story says Jesus can make all things new, now! So, he calls death sleep, assured no death is beyond his power to overcome whether it be on our Omega Day or any day between the Beta and Psi. We see life through the eyes of death; worried what happens after passing. Jesus thinks our anxiety about the Alpha and Omega and all between is the real illness that needs healing. He goes to great lengths with Lazarus and his empty tomb to show us death is no match for resurrection power that’s at work in all times. He sees all death through the eyes of new life and invites us to do the same. Lazarus was dead for 4 days when Jesus arrives in Bethany. Martha greets Jesus with an attitude; telling him if he had come earlier, he could’ve kept Lazarus from dying.Jesus tells her Lazarus will rise again.She is thinking, that’s all good,but Lazarus is the breadwinner and that doesn’t bring him back to take care of us now. She goes to the Omega saying, “I know he’ll rise again on the last day,when God raises all the dead.” Jesus speaks to the Beta and Psi, (the between times) using present tense verbs saying: “I’m the resurrection and the life. Those who believe in me,even though they die,will live,and everyone who lives and believes in me will never die.” He says we don’t have to wait to experience new life;it can happen now. Then, he calls out to Lazarus in a loud voice and he awakes and comes out. Like, Lazarus, Jesus calls our names when were buried. We can hear his voice call and awake, and be changed; coming to new life-right now. Every conversion is a resurrection. 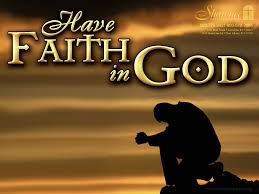 We answer Jesus;putting our faith in him. These persons we thank God today for placed their faith in Christ during their Beta and Psi times and Christ’s power worked to make them perfect in love of God and others. Love is our goal, but faith is the way there as we remain open to the possibility of new life when all seems gone. We believe we’ve already come alive, thus creating what we desire-new life. Faith sees death through and with the eyes of God who leads on a path toward love. We sang For all the Saints. Verse 5 said: “And when the strife is fierce, the warfare long, steals on the ear the distant triumph song,and hearts are brave again, and arms are strong.Alleluia!Alleluia! 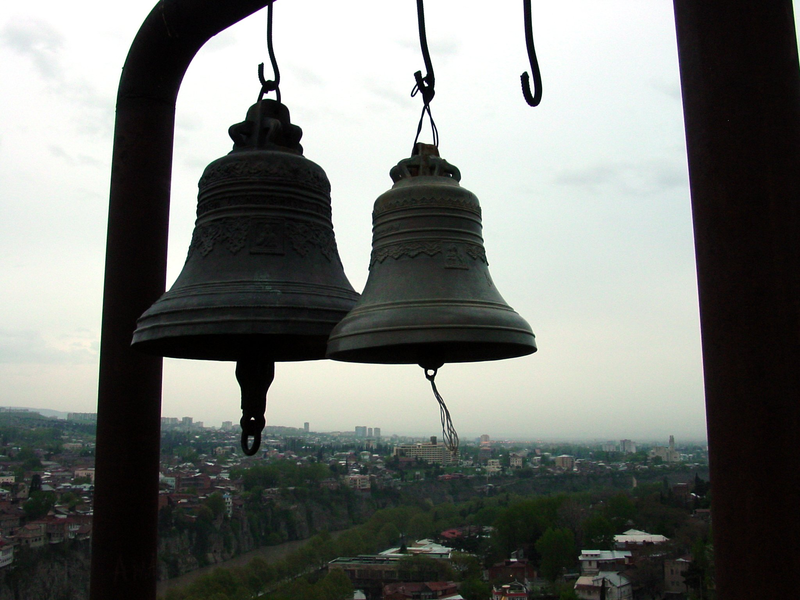 John Donne was right about the bells of death tolling for you and me. The triumph song of life also echoes in every chime for those who put their faith in Christ, long ago, today and till eternity rolls.